President Macron has announced that the Bayeux Tapestry will be loaned to Britain. This will be the first time in 950 years that it is left France, although it’s likely to be five years before it arrives here. It is not known where the tapestry will be displayed in Britain, although the British Museum must be a strong contender. The tapestry is thought to have been made shortly after the battle in the 11th century. It is currently on permanent display at Bayeux in Normandy. The towns of Hastings, and nearby Battle, have an obvious connection with the tapestry. They now take a far more positive view of what happened on that distant day in 1066. Below is an account of the visit I made to Hastings in 2013, and here, a visit to Bayeux in 2015. What does the town forever linked to England’s biggest home defeat do to wipe away those thousand years of hurt? Answer: take advantage of that instant recognition, and rebrand itself and its pretty Sussex hinterland as 1066 Country. I felt the tug of the sea the moment I walked out of Hastings railway station. No need for a map. Just follow the wheeling seagulls downhill to the beach. 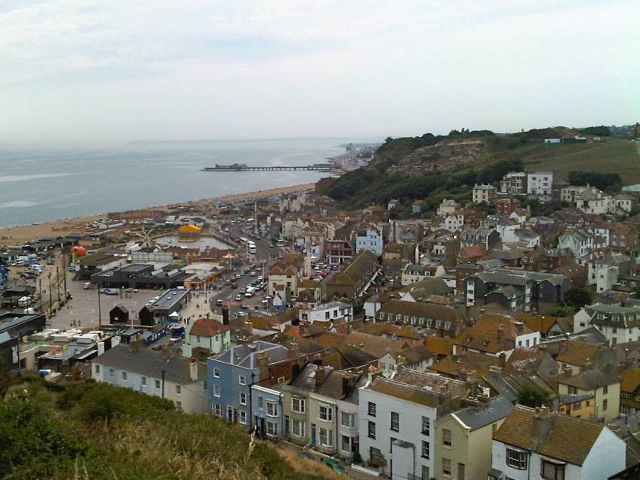 Hastings, the natural capital of 1066 Country, is burnishing its credentials as a leading South Coast destination, to match Brighton and Bournemouth. I took its pulse with a bracing walk along the prom, starting in the west in the sister town of St Leonards, which happens to be England’s oldest resort. Do this walk in a fog and you might think you’re pulling alongside an ocean liner. Marine Court, a 1937 art decor apartment block, was styled on the Queen Mary. Hastings changes style in a few short steps. I passed the Georgian Pelham Crescent, which would fit easily into Brighton, or Bath. Directly after that, I reached the sort of daytripper attractions you might find in Blackpool. But the real gold was waiting at the eastern end of the seafront. The Slade is the historic fishing quarter, huddling under the cliff face. It’s a mazy skyscape of steep roofed fishermen’s huts around the new Jerwood Gallery, which opened in 2012. A line of fishing boats was drawn up on the shingle. This is Europe’s biggest fleet of fishing boats which have to be launched from the beach. It seems quaint, but this traditional fishing culture may represent the future of our seas. Because they are small, the boats keep to local waters and don’t catch too much. No overfishing, and no discarded, wasted catches. A good place to taste this sustainable haul is Webbe’s at Rockanore, just back from the beach. They can even tell you the boat that caught your fish. It was time to try out some ancient public transport. The restored East Hill Lift took me up to a wide grassy plateau, with wonderful views back over the town’s terracotta roofs. This is the Old Town, Hastings’ original beating heart. I walked down into a network of old lanes borded by raised pavements with Victorian cast iron hand rails. There were tantalizing passageways, the “twittens”, leading off. The distinctive Old Town independent shops sell everything from antiques to organic food, via 1940s style dresses and glass sculpture. There’s a rich choice of one-off bakeries, restaurants and cafes. I walked on to the Hastings Museum and Art Gallery, for the life and times of Robert Tressell. He wrote The Ragged Trousered Philanthropists, an account his many hard days’ work in the 1910s decorating the town’s big houses. You feel every laborious brush stroke, the deep chill and the long hours. Then, a short walk away, another fascinating hour at the Hastings Fishermen’s Museum, with its jumble of photos, memories of marine heritage and random interesting items hauled up in fishing nets. Black Rock, a transformed Victorian villa in a quiet road on a Hastings hill, where I stayed, is the sort of place Tressell might have painted. It’s so different today. Jack Johnson was playing on the sound system as I checked in. In an earlier life it might have been Mantovani. This is an example of how far the bright new crop of boutique B&Bs have come. My room, the Sea View, was all light pastel shades. Sunlight streamed in through floor to ceiling windows. The owners are justly proud of their VisitEngland Breakfast award. I took two trips out into the surrounding 1066 Country – and you can make them both by train. The first was the obvious call, to the sloping battle site at Senlac Hill, near Battle. On a misty autumn afternoon I imagined the spectral arrows hailing down. Next day I travelled east to Rye, the hilltop town of distinction name-checked in the recent BBC adaptation of Parade’s End. Camber Sands is also mentioned. I looked over the wide, golden and blessedly empty (outside peak season) beach, just where the Benedict Cumberbatch character takes in the view. The cast stayed at the nearby Gallivant Hotel and that’s where I called for another delicious sustainable fish dish. Gareth stayed at the Black Rock boutique B&B.